The idea to make sweet potato pancakes was the result of an overstock of sweet potatoes in our pantry that we just needed to eat. My roommate (aka best friend, Elizabeth) and I are one in the same when it comes to experimenting and cooking healthy recipes in our apartment, so we figured there would be no more delicious way to enjoy something different with our surplus of sweet potatoes than to make pancakes. I found this recipe online and we modified it to use all ingredients that we already had in our apartment. To all my fellow college girls: you do not need to be a gourmet chef or have a pantry stocked full of food and random ingredients to make delicious and healthy recipes!!! For fall, I really want to try this same sort of recipe, but with pumpkin instead of sweet potato!! 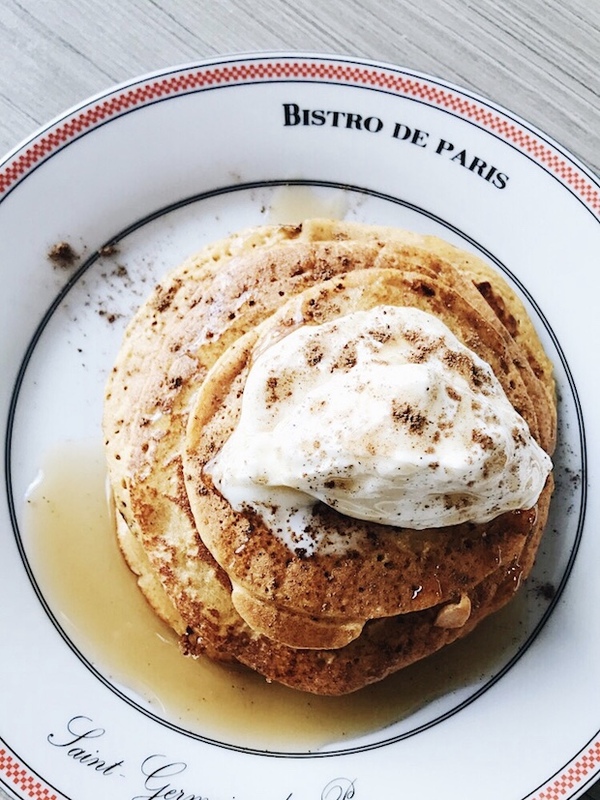 I love pumpkin anything, especially pumpkin pancakes. No matter what variation, I just know we will keep making these again and again. I mean, it doesn't get easier than mixing together some things you already have and tossing them in the blender! We used about half the sweet potato on Saturday and ended up making the pancakes again on Sunday with our leftovers. 1. Peeled a medium sized sweet potato and boil for about 20 minutes, and then mash up the whole thing (we did this part the night before and stored in the fridge overnight to save time, but you could totally do it in the morning) -- or just use the mash from a can! *Sunday's pancakes were a little bit better, and I think it was because I did more oats, less greek yogurt, making them a little fluffier rather than dense. Our favorite toppings are plain greek yogurt, cinnamon, and another big drizzle of maple agave! I can't even believe it's already October. Fall makes me so so happy. Caroline is coming to visit me this weekend and I can hardly wait to see her! Delicious, healthy, and easy enough that they only require basically 5 ingredients, these sweet potato pancakes are the perfect breakfast for fall! 7. serve and top with greek yogurt, cinnamon, maple syrup, honey, nuts, granola, or anything else! Oh my gosh, these sound amazing! I can't wait to try them!